»1? plot was Derek Dingle's routine of the same "^pU^ fap^ch. Bro. Hamman's version takes ^'Complete Works of Derek Dingle, which utilized a «»^shuffle appro P'*e mostly in the hands and moves off in its own unique direction. prepare by reversing «he four Aces on «he bottom of a face-down deck. To s. vrt say "Some people think that the deck Is a creamery We re going to have a couple of f0nb chosen by churn,ny up the deck." Bro. John s Rolling Control is used to force/control the selections Spr,, over abenu a third of the deck and nip it face up. back onto «he cards in your left hand. Spread pas, ,h, face-up cards, somewhere among the backs, and flip over all the cards on top of the deck Spread the cards into your rkjht hand as already described in "Blind Chance." taking them in a group at the center of right long sides, thumb above and fingers beneath. Push over all the face-up cards and the first face-down card Your right hand lifts them and flashes the underside of the packet toward the first spectator - ho told to remember that card. Drop the right-hand cards 011 top of the deck. Do one rolling cut. spreading Into the face-down cards lifting them, and flipping everything over back onto the deck. Repeat a second lime. Spread over all the face-up cards, and two face-down cards, into your right hand (The uppermost facedown card is the first selection.) Take that packet and flash its underside «0 the second spectator, askino him to remember the card he sees. Then, drop it back on top of the deck. Do one rolling cut. spreading Into the face-down cards, lifting «hem. and flipping everything over back onto the deck. Repeat a second time. 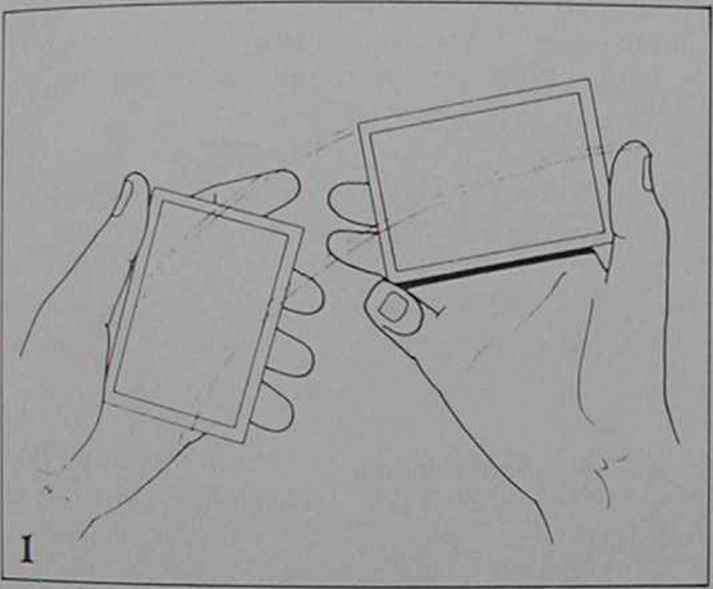 Spread over all the face-up cards, and three face-down cards, into your right hand (The first two face down cards are selections one and two.) Take that packet and flash its underside to the third spectator asking her to remember the card she sees. Then, drop it back on top of «he deck. Do one rolling cut. spreading into the face-down cards, lifting them, and flipping everything overbad onto «he deck. Repeat a second time. Spread over all the face-up cards, and four face-down cards, into your righ« hand. (The firs« three face-down cards are selections one. two. and three.) Take that packet and flash its face to the fourth spectator asking h.m to remember the card he sees. Then, drop it back on top of the deck. Guide the right-hand cards beneath the left-hand cards as shown. This brings the four reversed Aces to the t0P of the face-up deck. The selections are at the rear. During all of this you should be pattering about fu-e-up and face-down cards, and how mixed up the deck is. Table the deck and square it. then cut at the center and complete it. Turn the deck face^do.n and do wide ribbon spread as you say. " .and there are your cards - ^^^^T^Tm you spectators will reply negatively. Put the deck into dealmg P^^^^^^ ^le ttons) in line with the reach the Aces. Outjog them, then spread over the next up. Say. Let* get upper half of the deck. Your left hand flips the remainder of the dcCK tic these devils out of here." »hat s done, your right hand tables the upper, face-down. half. "9ht hand takes the packet at the center of its right long side, enaot g . ^are. Hip the face-up cards in your left hand face down. ,, ..r rarHs onto the table in a horizontal row from left to right, and ret*»,,, immediately deal the top ^J**™ The facc.d0wn card at the extreme left Is an indifferent i ^ suits you ve |ust Spoken In rt • one of the Aces remains on top of the deck. we«« m the ton.'' The next sequence is repeated four times n«**. deck, with an Ace directly beneath It. sav Notice that I will not yo anywhere near the bottom card I II churn up the top of the deck" Bro Hamman next does his RoUIng Control as a flourish revelation. During this you will say. The cream rises ro 'he fop Your left thumb pushes over about a quarter of the deck, and your right hand nips it over squared, back onto the cards in your left hand as you say. The cream..,. Spread over all the face-up cards and the two uppermost face-down cards. Your right hand takes all of them, squared, and flips them over onto the cards in your left hand as you continue, "...rises "
Spread over the two face-up cards, and the two face-down cards directly beneath them. Your nght hair! 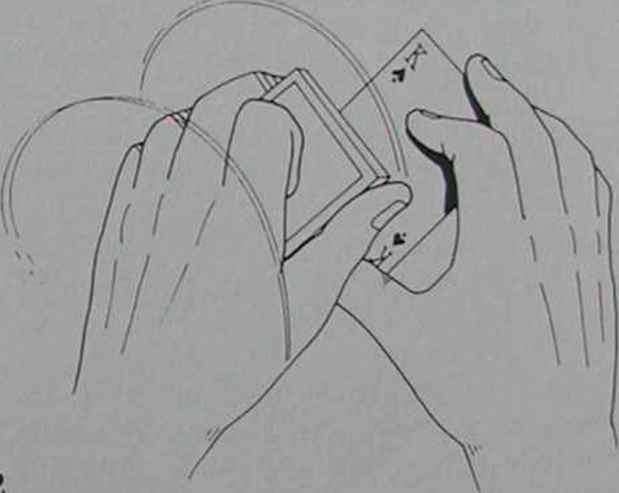 flips all four cards, squared, over onto the cards in your left hand as you say. "...to the top." An Ace will t* seen face up on top of the deck. Do a Double Turnover, flipping the double card face down and immediately deal off the top card Bro John does this with no getready as described at the beginning of the book. Table the dealt face-down card*: the right end of the row. It is, of course, the fourth selection. Double Cut two cards from bottom to top, drop the deck on the face-down card second from the right and repeat the "cream rises to the top" series of rolling cuts to reveal a second Ace. Flip the double card face down and deal the top card back to the position second from the right. Repeat the actions described in the preceding paragraph twice more. The first time, after Double Cutting two cards from bottom to top. the deck is dropped on the tabled card second from the left. The second time after the Double Cut. the deck is dropped on the card at the left end of the row. By the time everythwfl completed, there will be four face-down cards back on the table. The audience believes these to be theAce* when they are actually the selections In order from left to right. 'P the whole thing face down into your left hand as you say. ...ro the top." What follows is how Bro. John produces both the Jacks and Aces before proceeding, and also a revamped version of the transposition itself. Set up by secretly culling the Aces and Jacks to the top of the deck (Aces on top of Jacks) The patter is based on the fact that many people mispronounce the word "ask" as "aks." by pronouncing the "k" before the "s." (They may also say "ec-scape" instead of "escape" and "ec-cetera" instead of "etcetera.") For convenience. "Aces" and "Jacks" will be written "Axes" and "Jaxes" so you know how to mispronounce them for the patter. False shuffle and say. "This is a story about the most skillful guy I ever saw. He was really good He was from up north and talked a little funny. I went into a saloon up there one day and he was whipping the cards around and he said to me. Okay buddy, what do you want me to cut? I said. Don 't aks me! He said. Oh. you want the Axes — just watch this. Step Two. Your left thumb shoves over all the face-up cards plus a third of the face-down cards as well. Your right hand tips all of these over, back onto the cards in your left hand. thumb, which simply does not get out of the way as usual (fig.2). An Ace will be face P «p ot the packet. Your right hand lifts the packet resting on your left thumb and drops it on the table. Pick on the Ac, and drop it forward of the packet.